The Belo Monte Dam is mega-hydropower dam project in the Amazon Basin. Currently, the dam is under construction after a long legal battle within the Brazilian court system that has granted the construction company the licenses to begin. The dam will have the third most energy capacity in the world once completed. However, there are many environmental and social consequences to the Belo Monte Dam. The dam will cause deforestation, loss of biodiversity, loss of water flow and greenhouse gas emissions, while simultaneously displacing more than 20,000 local residents and impacting the livelihoods of the many indigenous communities in the Amazon Basin. There have been many international and national protests to show the world discontent with the Belo Monte Dam. Still, the people fighting the dam construction are not being heard and may resort to more violent protest. In the Amazonia region, the Belo Monte hydroelectric dam controversy has been a struggle since the Military Dictatorship in the mid-1970s when it was first proposed. At first, the Military dictatorship table the dam construction due to lack of funding. The dam proposal all started when Eletronorte (The Brazilian Governmental Northern Electricity Business) realized the potential for hydropower on the Xingu River. Therefore, Eletronorte contracted the Consórcio Nacional de Engenheiros Consultores (CNEC) to do a study of the region. The CNEC discovered five areas for potential dams along the Xingu River in 1979. Belo Monte, originally known as Kararaô (by the CNECO) became part of Eletrobrás’s “2010 Plan” that consisted of building around 300 hydroelectric dams by 2010, after being resuscitated in the 1980s by President Sarney. Once the consequences were assessed, many of the indigenous and community groups fought the dam in 1989. The international community was brought into the struggle when two leaders of the indigenous tribe, Kayapó came to Washington DC to speak to the World Bank, the United States Treasury, and Congress in 1988. Next, dozens of indigenous tribes met at the Conference of Indigenous Peoples of the Xingu close to a town called Altamina, where they protested the potential dams on the Xingu River. 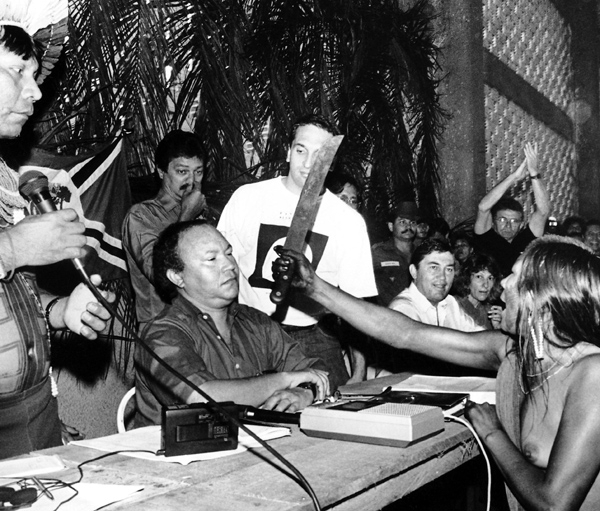 The project was delayed due to the strength and impact of the indigenous community: “The most dramatic single image to emerge from this tumultuous gathering was that of Tuíra, a female indigenous leader, angrily waving a machete in the face of engineer José Antônio Muniz Lópes (later president of Eletronorte), which had worldwide repercussions and probably influenced further postponement of the project” (Branford, Hall 3). After being redesigned from 1989 to 2002, Eletronorte presented a new environmental impact study that included alternative dams. Then, in 2008, the Eletronorte presented further changes that moved the flood reservoir away from the indigenous land. The former President Luiz Inácio Lula da Silva accept the construction of the Belo Monte dam as part of his new program called the Programa de Aceleração do Crescimento (Program to Accelerate Growth) to help power future industrial growth. The construction began in 2010 when the Brazilian Institute of Environment and Renewable Natural Resources (IBAMA) issued the first license. As of June 1st, 2011, Eletronorte has the full license for full installation of the dam after the IBAMA agreed the dam is in accordance with the Environmental Impact Reports. There is still resistance from international Non-governmental organizations (NGOs) and the indigenous tribes. After years of struggle through the legal system, the government approved the dam construction in June 2011 as part of their goal to reduce their Carbon Dioxide emissions by 40% by 2020 (The Brazilian National Government 2011). Now, there are still civil society groups and indigenous tribes fighting the dam. Once completed with a planned installed capacity of 11,233 Megawatts, the dam will be the second largest dam in installed capacity in Brazil after Ituipa Dam on the Brazilian-Paraguayan boarder and the third largest in the world behind the Three Gorges dam in China and Itaipu. The dam has the capacity to give electricity to 23 million homes, however most of the energy will be used by the mining and other industrys within the area (Garivaltis 5). At the present, the dam is being built despite the many groups fighting construction. In the Amazon Rainforest, the Belo Monte Dam is located on the Xingu River in the state of Pará. The Sectors of the Brazilian Government are fully supporting the dam construction for economic development. The main sectors are Ministry of Mines and Energy (MME), Eletrobras (Brazilian Electrical Centers—the agency under MME responsible for Brazil’s energy development), and Eletronorte (Electrical Centers of the North of Brazil—the government company responsible for electrical power in Brazils northern Region). Additionally, the Brazilian National Bank for Economic and Social Development (BNDES) is funding the project. The barrageiro are the dam builders in Brazil fully support the Belo Monte Dam. They describe the dam as mecca of all dams and believe it will work perfectly. The environmental consultant often support the program due to the profit made from the dam. On the international level, the aluminum and alumina industry supports the construction of the dam for the use of their product (Fearnside 19). The main actors against the dam construction are the indigenous tribe and local residents that are directly affected by the dam. More than 800 indigenous people from the Juruna, Xikrín, Kuruaya, Arara, Xipaia, Kayapó and other ethnic groups live in this region (Intenational Rivers 2012). In addition, FUNDAI (The Brazilian National Indian Foundation) acknowledges the possibility of unknown tribes within the area that will be affected by disease and the dam project (Survival of the Tribal People n.d.). By giving their full support, local and international environmental and social NGOs are helping the indigenous and local residents fight the construction of the dam. Comissão Pró-Índio de São Paulo, Cultural Survival, and the Missionary Indigenous Council (CIMI), Movement of Dam-Affected People and Development of the Trans-Amazon Highway and the Xingu (MPDTX) are some of the local NGOs supporting the movement against the Belo Monte Dam. The International NGOs are International Rivers Network (IRN), the Living Rivers Coalition (CRV), the Socio-Environmental Institute (ISA), Friends of the Earth–Brazilian Amazonia, Environmental Defense (EDF), Greenpeace and Conservation International (Fearnside 19). The Belo Monte Dam will be two major dams with two reservoirs and one large canal. The two reservoirs will cover about 512 squared kilometers; however more than 1,500 squared kilometers will be affected (International Rivers 2012). The canal is suppose to 500 kilometers wide (International Rivers 2012). The reservoirs are estimated to cover an area as large as Chicago (Da Fonseca and Bourgoignie 105). "Projections say that more than 6,000 km2 of forests in Altamira would be damaged, and one third of the population would be relocated with a possibility that up to 40,000 people could be displaced or greatly affected by the inauguration of the dams" (Garivaltis 5).Majority of the land that will covered in water is now Amazon forest, therefore the dam is contributing to the deforestation of the Amazon, which has been increasing in the last couple of decades. By diverting the river by 80 percent, especially around the Big Bend, the climate will change without the seasonal water flood in an area that has extensive biodiversity. The Amazon rainforest has one of every ten species on Earth. By affecting this biodiverse hotspot, we can lose species that are endangered and some species that are unknown. This will jeopardize the aquatic flora and fauna; especially the endemic and migratory fish species which is commonly lost in most dam sites. "The black and white-patterned Zebra Pleco fish, which is found only on the Xingu River, is likely to die out if the dam is built. The Sunshine Pleco (Scobinancistrus aureatus), the Slender Dwarf Pike Cichlid (Teleocichla centisquama), the Plant-eating Piranha (Ossubtus xinguense) and the Xingu Dart-Poison frog (Allobates crombiei) are other species whose existence is threatened by the dam" (Jagger 2012).Additionally, the land flora and fauna will be affected by jeopardizing many endangered species, such as the White-cheeked Spider monkey and Black-bearded Saki monkey (International Rivers 2012). The Belo Monte Dam will have an installed capacty over 11,000 Megawatts, however the dam will only generate about 4,500 Megawatts due to the large seaconal variations in water flow. For example, International Rivers estimated that the dam will only generate 233 Megawatts when the river is the lowest during the dry season. The Dam will not generate the full power available for three to five months of the year (Hall and Branford 38).Due to the variations in water flow, a study by the Conservation Strategy Fund found that the damwill not be economically viable, unless there is more dam construction on the Xingu River including the Altamira Dam that will have a resvior twelve times the size of the Belo Monte's resesvoirs (Jagger 2012). Although, Hydropower is considered a renewable energy source and does not emmit green house gases, some scholar quesion if the construction does not contribute to Climate Change. The Belo Monte Dam is affected by climate change by being an alternative source for electricity. The construction of the dam is to help prevent green house gas emissions. However, the reservoir does eliminate part of a carbon sink by flooding the forest and some dams produce green house gases: “Hydroelectric dams produce significant amounts of carbon dioxide and methane, and in some cases produce more of these greenhouse gases than power plants running on fossil fuels” (Graham-Rowe 2005). Overall, the hydropower is an alternative renewable energy source that helps prevent climate change by not using other sources of energy that emit more green house gases. Harm Site: Belo Monte Dam Construction Site and land affected by the resvoir and dam. It is estimated that anywhere between 20,000 to 40,000 people will be relocated from the Belo Monte Dam. As more than 8000 Indigenous Tribal members see their homes and their livelihoods being destroyed by this dam project, they are prepared to fight. The indigenous tribes are determined to prevent the Belo Monte Dam: “In a May 1 interview with the French channel TFl, Chief Raoni of the Kayapó said, "I have asked my warriors to prepare for war, and I have spoken of this with other tribes from the upper Xingu. We will not let them [build this dam]" (Diamond, Poirier). But, the indigenous people’s struggle for their right to their land has caught the attention of the international community, including many celebrities, such as Sting and James Cameron throughout the Belo Monte Dam controversy. Additionally, the fishermen who live off of the river have prevented the transportation of material to the Belo Monte construction sight by preventing the transportation along the Xingu River. This injustice has inspired many different rallies and demonstration by Brazilian civil society. The local residents are protesting for their rights to be heard by the government. This action is causing more tension between the local government and the people surrounding the river. Between 1989 and 2002, the Belo Monte project was redesigned. Between 2002 to 2008, the Belo Monte project was being assessed for environmental and social impacts. In February 2010, Brazilian environmental agency IBAMA granted a provisional environmental license, one of three licenses required by Brazilian legislation for development projects. On 14 August 2012, work on the dam was halted by order of the Brazilian Federal Court, when federal judge Judge Souza Prudente, halted construction on the controversial Belo Monte dam in the Amazon, saying that the indigenous peoples had not been consulted. The Supreme Federal Court overturned the decision on August 28, 2012 and ordered construction to recommence. In the Beginning of April 2013, Indigenous groups sent a letter to President Dilma Rousseff with a Declaration of War. Even though there are many international actors within the controversy, the main conflict is civil between the government and the indigenous tribes and other citizens living on the Xingu River. This conflict would be considered Infrastructure because the am construction destroys people's homes and livelihoods causing the violence occcuring. The main violent conflict occurs between civilians and the Indigeous communities.There will be alow death count of civiliand and Indigenous tribal members due to the legal battle in the Brazilian Judicial system. This Casual loop diagram shows the effects of building the Belo Monte Dam in the Amazon Basin in Brazil. The major negative effects on the local people, indigenous tribes, and other species are on the right side of the diagram. Dam building will cause flooding and loss of land that leads to cultural damage of the indigenous tribe's homes and livelihood causing conflict between the local workers and Brazilian citizens. Then, the indigenous people will have to migrate to cause further damage between the local Brazilians and the indigenous tribes, therefore more conflict. Additionally, the land loss by building the dam will cause species loss due to their loss of habitat and changes in their environment. On the left side of the diagram, the dam building affects the climate. Overall, the dam building causes climate change through the transportation of materials and workers during the building process and the use of fossil fuels. The main purpose of the dam is to provide for the increasing energy demand by the Brazilian citizens and industries. By using renewable energy, the cost of energy will decrease, therefore more Brazilians demand electricity powered by renewable resources. The concept of climate change and other environmentalist increase the demand for the use of renewable resources to prevent further greenhouse gas emissions, which reinforces the need to build the Belo Monte Dam. "A Knife in the Water." International Rivers. Internatioal Rivers, 7 Mar. 2008. Web. 06 May 2013. Adams, Jacqueline. "Battle Over the Amazon." Science World Sep 03 2012: 10-3. ProQuest. Web. 2 May 2013 . Bapista, Fernando M., and Kjersti Thorkildsen. The Belo Monte Dam: Camel in the Tent? Rep. N.p. : Norwegian Latin America Research Network, 2011. Print. "Belo Monte Dam." Belo Monte Dam. Survival for Tribal People, n.d. Web. 04 May 2013. "Brazil's Belo Monte Dam: A Conflict in the Amazon." Belo Monte Dam: Conflict in the Amazon by : Yale Environment 360. Environment 360, 4 June 2012. Web. 06 May 2013. Brazilian National Government. Ministry of Mines and Energy. BELO MONTE HYDROELECTRIC DAM PROJECT FACT SHEET.Http://www.brasil.gov.br/para/press/files/fact-sheet-belo-monte-1. Brazilian National Government, May 2011. Web. 4 May 2013. Carvalho, G. O. "Environmental Resistance and the Politics of Energy Development in the Brazilian Amazon." The Journal of Environment & Development 15.3 (2006): 245-68. Print. Da Fonseca, Patricia Galindo, and Antoine Bourgoignie. "The Belo Monte Dam Case." Environmental Policy and Law 41.2 (2011): 104-7. ProQuest. Web. 6 May 2013. Diamond, Sara, and Christian Poirier. "Brazil's Native Peoples and the Belo Monte Dam: A Case Study." NACLA Report on the Americas 43.5 (2010): 25,29,39-­‐40. ProQuest Central; ProQuest Social Science Journals. Web. 29 Jan. 2013. Fearnside, Phillip. 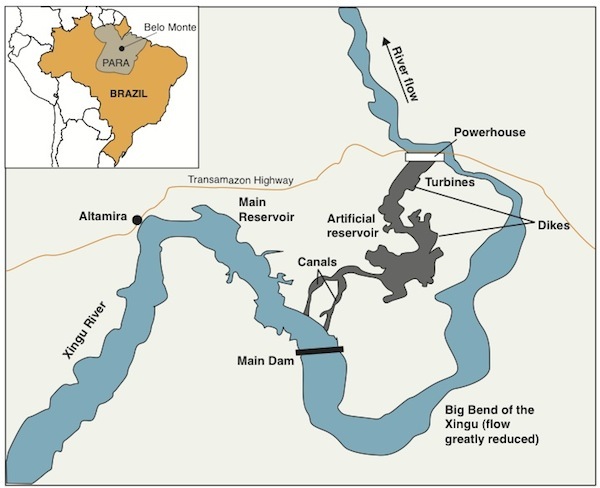 "Dams in the Amazon: Belo Monte and Brazil's Hydroelectric Development of the Xingu River Basin." Environmental Management 38 (2006): 16-27. Print. Graham-­‐Rowe, Duncan. "Hydroelectric Power's Dirty Secret Revealed." New Scientist-­‐ Environment. New Scientist, Feb. 2005. Web. 29 Jan. 2013. Garivaltis, Leland. Belo Monte: Controversial "Clean Energy" Mega Project. Washington, United States, Washington: The Council on Hemispheric Affairs, 2010. ProQuest. Web. 6 May 2013. Hall, Anthony, and Sue Branford. "Development, Dams and Dilma: The Saga of Belo Monte." (n.d.): n. pag. Sage Journals. Web. 29 Jan. 2013.
International Rivers. 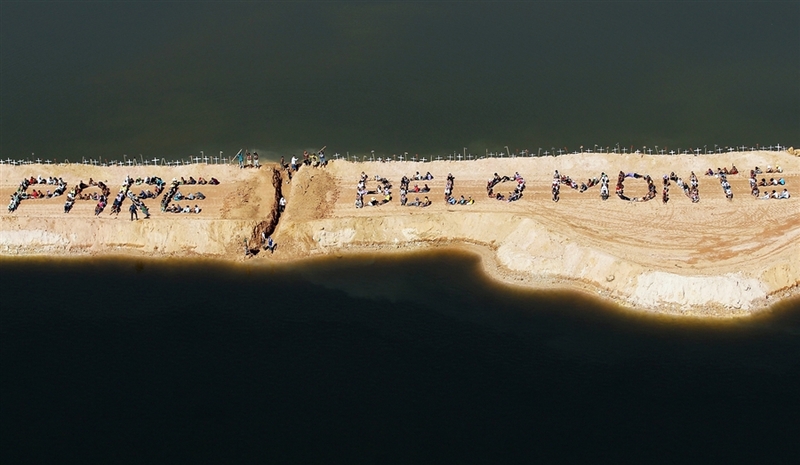 Belo Monte: MASSIVE DAM PROJECT STRIKES AT THE HEART OF THE AMAZON. Publication. Internatioal Rivers, May 2012. Web. 4 May 2013. Jagger, Bianca. "The Belo Monte Dam: An Environmental Crime." The Huffington Post. TheHuffingtonPost.com, 21 June 2012. Web. 04 May 2013. Korshak, Stone. "Dam Energy." The Rio Times. The Rio Times, 1 Nov. 2011. Web. 06 May 2013. Sihgn, Timon. "Belo Monte Dam: Sacrificing the Rain-forest for Clean Energy." The Belo Monte Dam. EU Infrastructure, 5 Feb. 2010. Web. 04 May 2013. Watts, Jonathan. "Amazon Tribe Threatens to Declare War amid Row over Brazilian Dam Project." The Guardian. Guardian News and Media, 03 Apr. 2013. Web. 04 May 2013.